You may have received paperwork from your insurance company asking about your accident case. This is because the insurance company wants to be reimbursed if someone else’s negligence is determined to have led to the injuries covered by your policy. If you look at your insurance contract, you will most likely find a provision for reimbursement pertaining to injuries caused by third parties. The paperwork you received will likely consist of a form or questionnaire from the insurance company itself or a company they have hired. You will need to respond accurately and in a way that is fair to both you and the insurance company. You should meet with your attorney to discuss the best responses to the paperwork. The reimbursement request can also affect your settlement, and your attorney can assist you in determining answers that will be both truthful and favorable to you. Watch the video to learn more. Many times resolving the claim with the careless driver's insurance company is less work than negotiating with the client's own health insurance. Some health insurers want their insureds to pay them the "first dollar" recovered until all of the benefits paid are reimbursed. If there is not enough money left over to compensate the injured party, that is not their problem. In cases such as this, it is important to look at the health insurance Summary Plan Description and Plan Document BEFORE going too far into a case. 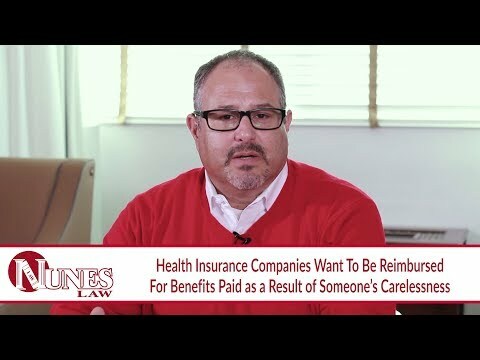 If the injured party's health insurer does not want to share in the costs of pursuing a claim from the careless party, then it may be best to forego making a claim at all.